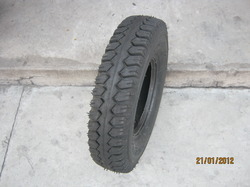 We are Leading Manufacturer and Supplier of Wheelbarrow Tire set. One Set Includes One Tyre, One Tube and Disc. Being a well-distinguished company in the market, we are into offering Rubber Tyre. For total satisfaction of our customers, we are into offering Solid Rubber Tyre (Oil Resistant Rubber Tyre). With the experience of 25 years, we are engaged in manufacturing and supplying the premium quality of solid rubber Tyre and to manufacture these products we are associated with the trusted vendors. Our products have inbuilt radial wiring which increase the gripping of the tyres and these products are provided with single, double and triple wiring facility. Our Range of Solid Tyres are Specially designed to withstand Extreme Mechanical Stress and Strains. The Tyres are Manufactured, based on Latest Multi - Layer Manufacturing technology. Ranging from antiozonant waxes, lubricants and process aids to flow promoters and anti-adhesives (slab-dips) for rubber articles, PMC Crystal’s product line helps to serve the broad passenger tire, ag tire & rubber processing industry.